Here’s a brand new way of creating decorative soldering dots. It’s neat, its foolproof and it’s quick. You can’t argue with that. It was suggested and demonstrated by Georgia Hamilton. A big hands together for Georgia. Once you’ve got the hang of this technique you can move on to the more difficult ‘drippy soldering’ method. It’s beautiful and really adds something different to your work. You can read about this decorative soldering technique here. How do you achieve the tiny soldered “dots” on some of the copper foiled glass jewelry i’ve seen? i use a weller 100 with a 1/8″ tip for my pieces. is there a special tiny tip for that? or should i be able to achieve that using that tip? Thanks for your question Cheryl. The tiny solder balls that you’re referring to are the result of a technique called ‘decorative soldering’. It’s the solder that you might need to buy. If you’re using 60/40 tin/lead, you might be better off buying some 63/37. This special solder sets up quickly which is great news for decorative soldering and TRYING to achieve lumps! I explain in my video about the solder and iron tips. 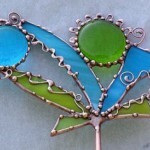 It shows you how to transform the edges of your sun catchers with ‘drips’ (see image above). It looks fabulous and really adds a layer of artistry to your work!!! – Continue along, making the balls as close or far apart as you like. If you want bigger dots, you just hold the solder on the iron tip for longer. That’s all there is to it! Once you’ve got the hang of this, you’ll find lots of other ways of decorating your jewellery with solder. It’s a great way to spice up soldering and add excitement to your work. Good luck, and come back with some photos! Thank you so much for the information both in the article and the comments. I’ve wanted to do this for so long but didn’t know what solder to use. You have made me really happy. I have always heard that for safety reasons, a lead free solder works best for jewellery. Should the leaded jewellery be that close to the skin? Hi Cheryl, yes, I’d use lead free solder for anything that is in contact with skin. I am using a lead-free solder (97% tin and 3% copper) as I make jewellery. I am struggling to make the balls though – I am using a small cone-shaped tip. It is clean and even when I turn the heat up the solder doesn’t want to make a ball! I simply can’t get it to the stage where a drop would form. Any advice? Thanks. Hi Kate, I can’t help you with this as I’ve not used lead-free solder for decorative soldering. What gauge wire did you use for all the curly q’s? I love this piece! I could lie and say I made this, but I didn’t! It’s called Balancing Act and it’s by Dianne McGhee. Whenever I’ve used wire to decorate my panels, I’ve used between 14 and 20, with 20 being the thinnest. 16 is the one I like using best and the one I’ve found to be most useful. Don’t forget to tin and straighten it first. If you have any more ideas about decorative soldering, add your comments at the bottom of the page; we’d all love to hear them. Thanks. Hi, what is the tape its 3m but which type ? Thanks for your question Paul. The tape idea is, without a doubt, one of the best tips I have ever seen! Thank you for sharing it. All thanks to Georgia for the tape one 🙂 I appreciate you taking the time to comment. Hoorah to projects just for ourselves! I hope it adds that special touch that a panel for oneself deserves. Thanks for sharing this, Milly. I would like to put “blobs” of solder on my glass. Have you ever punched out a dot of foil and stuck it on the glass and then dripped solder onto the foil? Do you think the solder dot will stay in place during cleaning, patina and waxing? If it works, it will make a nice tiny bird’s eye with materials I already own. Guess what I will be doing this afternoon?! A dot on its own is very vulnerable and will likely come off in the cleaning process. If you add glue into the equation it will work. Just solder the dot and put a dab of glue on the back.